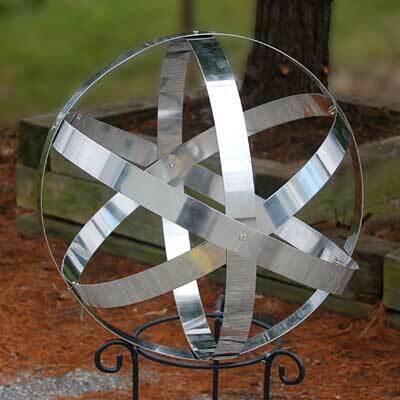 Place a unique adornment in your landscaping with the Rome Stainless Steel Banded Sphere. This open orb evokes both a gazing globe and modern sculpture, lending classic shape and design to your backyard. Three, 1.5" wide, stainless steel bands are connected with screws, and are simple to spread apart for a striking look. A fourth band encircles these units and screws into place through the predrilled holes, keeping the globe secure and lovely. The bright, silver color of the all steel unit gleams in the sunlight, and brings a modern hint to the piece. This orb easily rests on a stand (not included), a level surface, or can be placed inside a large planter for a different effect. Its steel body lasts for many seasons, and the item may be collapsed for seasonal storage if desired. Blend contemporary style with classic themes in your yard using this Stainless Steel Banded Sphere. Assembly required. Note: This description refers only to the Rome Stainless Steel Banded Sphere. The stand shown is not included.